Last weekend I set out for my longest run since all of my injuries started. My goal was to run for an hour and to see where that got me. I was hoping it would get me at least 6.2 miles for my Home Run 10k with Jost Virtual Racing, but if it didn't, then I would definitely try again. 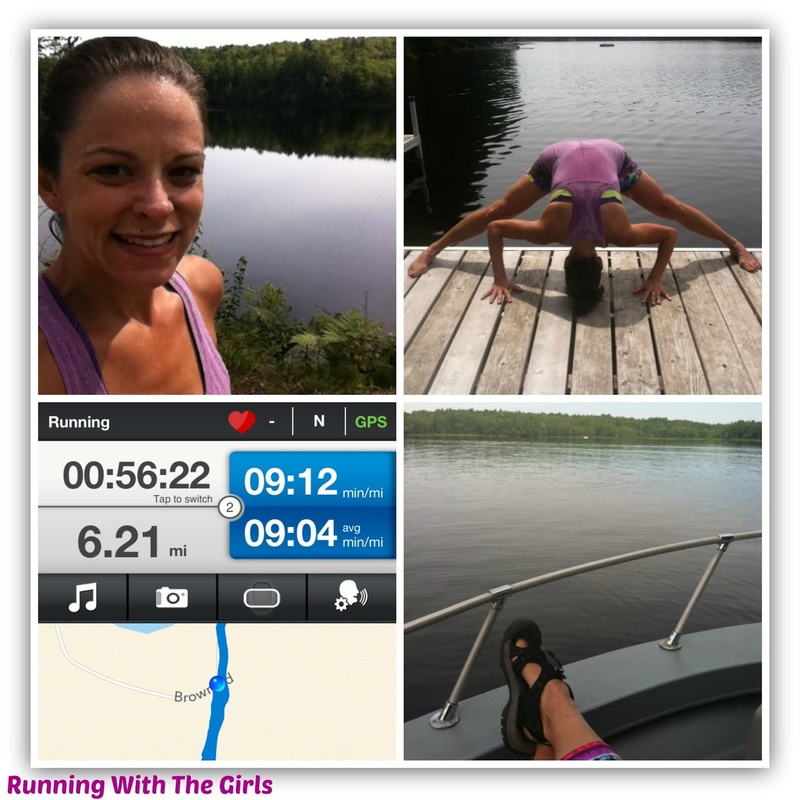 Unfortunately, I waited a bit too long to start out on my run, so when I finally started running it was HOT! I love running at the camp because those side roads provide me with some nice, tranquil scenery while running past a few ponds. I took the run nice and easy. Near the end of the run, I couldn't wait to get back there, head straight down to the deck, do some yoga then jump in the water. Then of course, just sit back and relax the rest of the day. I'd call that perfect! And guess what? My medal came yesterday! It's a really cool medal. Heavy and great quality. A perfect addition to my medal collection!!!! I love it. Who wouldn't want a hot dog medal? It's so much fun!!! And here's a view of the Half/Full Marathon Medal. I love how the middle part spins around. The half marathon was from 8/11-17. Darn! I missed out. I am pretty confident Ward ran at least a half marathon during that time since he's training (for yet another) marathon. If I was a nice wife, I'd give it to him. Since he ran the miles. He earned it. It's freaking cool medal as well. 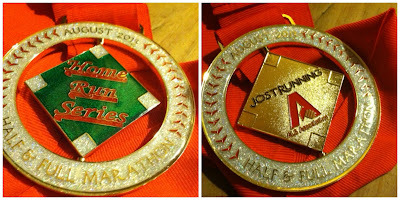 I'm really excited by working with Jost Virtual Racing and the great medals they send out to their racers. It's really making the $25 fee look even better. Wow! A race on my own time and a great medal for a low price? Yes please! Now I'm getting excited for September's races. Have you seen them? Great run and awesome medal!!! I was thinking before summer was over about ending a run with a dip in the ocean!! Glad you had a great run! 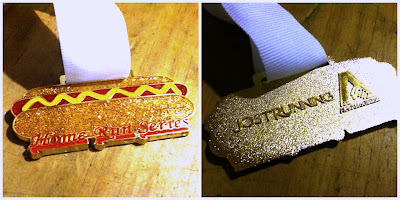 That hot dog medal is all sorts of awesome! I hadn't heard of those races, but I will have to check them out, those are cool medals! Glad you had a great run, even if it was hot. I am so over hot weather!! Oh you need to!!!! I did that once after a 10 miler back in July. Awesome feeling! Isn't awesome? I just love it!!!! I had to fight the kids off. You could definitely hold your own virtual races with you and your kids! It would be fun!!!! never heard of them either!!!!! I've seen this on Facebook, but I haven't participated in any of them. Great job on your run and I'm glad you could jump in the water right after! That's awesome. I hadn't hear about it. Going to have to check it out. Very cool! I've never done a virtual race.